Explore the traditional lands of the Peramangk, overlaid with a patchwork of passions and dreams of early German and English farmers, gardeners, orchardists, tiers men, bush rangers, gold miners and vignerons. Discover rich and valued heritage in the Adelaide Hills, reflected in solid stone buildings from an earlier era, streetscapes and unique farming patterns reflecting cultural traditions of early migrants, and museums that preserve and cherish artefacts and irreplaceable collections. The cultural story of the Adelaide Hills began with the Peramangk traditional custodians; they 'wrote' the first thousand chapters as they cared for country, whilst living, trading and meeting for ceremonies with the neighbouring Ngarrindjeri and Kaurna peoples. We respect their spiritual relationship with their country and their cultural beliefs, which are still important today. For information on the Peramangk people please see Indigenous History and Culture. Not long after South Australia was established in 1836 the colonists began settling in the Adelaide Hills. One of the first towns was Norton Summit settled in 1837, shortly followed by Hahndorf, Crafers, Gumeracha, Meadows, Mount Barker and Oakbank. Many of the Adelaide Hills’ early immigrants, including the Prussian settlers who established Hahndorf, Lobethal and Birdwood, were fleeing religious persecution and the Hills provided them with a new beginning. Those seeking refuge of a different kind were the colony’s cattle thieves, sly grog merchants and bush rangers, who often hid out in the Hills, along with the tiers men who worked the stringybark forests. The mid to late 1800s saw the gold rush arrive and with it thousands of new settlers hoping to find their fortune. The most successful site was Jupiter Creek at Echunga, which attracted 1200 miners at its peak. With only a third of prospectors making money the rush was short-lived, however miners returned in the 1930s when the Depression saw hundreds try their luck. By the late 19th century, the towns of Stirling, Mylor, Uraidla and Woodside had sprung up, fuelled by the brewing, milling and farming industries. Around this time many of Adelaide’s wealthy residents started to build grand summer houses in the Hills as a cool retreat from the city’s hot summers, many of which are still lived in. The working agricultural landscape of the Mount Lofty Ranges reflects a unique story of human interaction with the land and is currently the subject of a proposal to have a corridor of land from the Fleurieu Peninsula to Barossa designated a World Heritage site by UNESCO. See more information about the bid here. The self-guided Jupiter Creek Heritage Trail near Echunga provides an insight into the gold rush era that swept through the Adelaide Hills in the mid-1800s. Please note the 80-metre Phoenix Tunnel was recently closed permanently due to safety concerns. Fossicking by hand is permitted. For additional information see the Weekend Notes article (2016) and an old Energy and Mines SA brochure (1994) which, although dated, has some interesting background and a map. 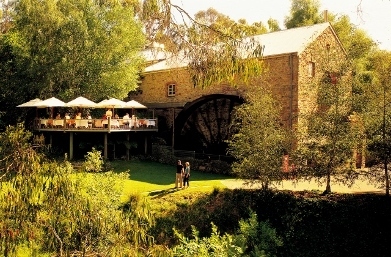 Flour mills were built throughout the Adelaide Hills during the 19th century and the giant waterwheel still turns at the Bridgewater Mill, now home to a restaurant, wine and coffee lounge. Situated on the Bremer River, the township of Callington is a well-preserved microcosm of a mid-19th century Australian mining community, with the whole township included on the Register of the National Estate. This elegant Edwardian property was the home of Australian landscape artist Sir Hans Heysen until his death in 1968. Visitors to The Cedars can see the artist’s studio, a collection of his works and tour the property’s superb gardens. The historic village of Hahndorf, settled in 1839, is Australia’s oldest surviving German settlement. 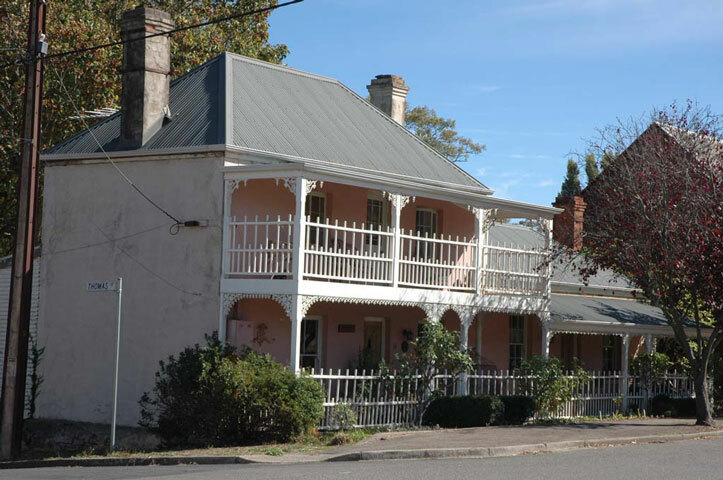 Many of the original buildings are still intact, including The Hahndorf Academy, which houses galleries, studios, a small museum and shop featuring the work of local artists. Explore this fascinating village on a walking tour with passionate local historian Sharon Pippos from Hahndorf Walking Tours. This historic precinct was home to the Onkaparinga Woollen Mill, which operated between 1870 and 1993. The building is now home to a number of businesses including the Lobethal Bierhaus microbrewery and restaurant, and is an emerging arts and heritage hub. Established in 1843, heritage-listed Glen Ewin Estate in the northern Adelaide Hills was the home of Glen Ewin Jam. The estate still features beautiful old stone buildings and has a bistro, regional cellar door, function venues and fig orchards where visitors can pick their own figs (February and March). Housed on the site of the historic Birdwood Mill, the National Motor Museum has one of Australia’s best collections of old and rare vintage and classic vehicles – but more importantly it’s a social history museum that brings to life the stories of Australia's love affair with motoring. Located in the picturesque southern Adelaide Hills village of Prospect Hill near Meadows, the Prospect Hill Historical Museum consists of a complex of historic buildings along the main street, depicting the life of early pioneers and showcasing the dairy industry of the area. Heritage-listed Auchendarroch House was built in 1860 by Scottish immigrant Lachlan McFarlane and has had numerous purposes and owners, including prominent businessman and philanthropist Robert Barr Smith. Today Wallis Auchendarroch House and Tavern is a Mount Barker landmark housing Wallis Tavern, Mount Barker Cinemas and lavishly decorated rooms featuring William Morris wallpaper and leadlight windows used for corporate events and social functions. Established in 1843 by the Scottish Johnston brothers who settled Oakbank and Woodside, the Johnston’s Oakbank Brewery buildings now house the O’Leary Walker winery cellar door. Based in the cellar of the old Pike’s brewery in Oakbank, The Oakbank Weaver produces handwoven tapestries and textiles. Build between 1852 and 1858 as a summer residence, Mount Lofty House was all but destroyed by the Ash Wednesday bushfires in 1983 but has been restored to its former glory and is now a grand boutique hotel and restaurant overlooking the beautiful Piccadilly Valley. Built in 1878 as the summer residence of South Australian Governors, the grand Marble Hill mansion was all but destroyed by fire in 1955. Over the years, the ruins have been open to visitors on designated days and the site has been the setting for events. Now an exciting full restoration is in progress including a cellar door for Marble Hill Wines. Officially declared a State Heritage Town, Mount Torrens is one of the Hills’ most well-preserved historic towns. A stopping point for bullock teams travelling between Adelaide and the River Murray along with development of pastoral and rural industries in the 1840s provided the basis for the town. This is still evident from the substantial dwellings, many of them two storied, still in wonderful condition today. Visitors can follow the Heritage Trail - Townsend, Prescott, Thomas and Tuck Streets all feature impressive and interesting buildings which are described on interpretive plaques. The Old Coach House on Townsend Street displays numerous historic photographs and artefacts along with historically significant architectural drawings of some of the old buildings.